A Red Mushroom is a poisonous fungus which grows in forests. In most map generators, it can be found in deciduous forests and coniferous forests (→Biomes) on dirt with grass blocks, and occasionally on fallen Pine Tree and Aspen Tree logs. 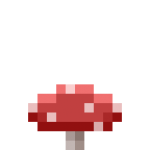 In the v6 mapgen, red mushrooms only grow next to a Tree on dirt with grass. Red mushrooms will spread slowly over time on Dirt, Dirt with Grass, etc. and on “trunk” blocks (Tree, Jungle Tree, etc.) in complete or almost complete darkness, making them renewable. They will eventually die off in direct sunlight. They can be collected with bare hands. Be careful, red mushrooms are poisonous and when eaten, they will poison you and reduce your health by . Red mushrooms can be placed with right click, just like almost any other node. This page was last modified on 20 February 2019, at 17:11.